CAMP – ENGLISH – Dobrodošli! Andrea Lekic accepted the challenge of transferring her experiences as a handball player and a regular person for generations to come with the help of our team of experts. She accepted the challenge of sharing the joys of growing up, maturing, learning and making progress with them. To teach them how to be friends with each other and respect each other, because the only way they can succeed is by working as a team. 26.6 – 2. 7. 2019. Ruma is a town and municipality located in the Srem District of the Autonomous Province of Vojvodina, Serbia. The closest airport is in Belgrade. Our main hallmark is the fact that we are extremely committed to broadening their knowledge, perfecting their technique and sportsmanship, helping them address their opponents, teammates and referees appropriately, as well as developing their overall general knowledge and team spirit. “I believe that I can use myself and other successful athletes as an example and promote the sport in the right way, guiding the children through their journey and showing them the right path. Taking responsibility and organizing all of this is not an easy feat, there are a lot of obstacles to overcome in order to make everything happen, but as soon as I see all of those happy children and feel their undying energy, I know for certain that it is one of the most important decisions I have ever made during the course of my career. It is incredibly rewarding to see how the children are listening carefully and absorbing everything they are told. Recognizing the fire in their eyes and their efforts to do what their coaches expect them to, watching their constant need to prove themselves worthy; All of these things present a kind of magnet that constantly “attracts” me and my team, and it gives us incredible energy. The moment when one of the best handball players in the world, Andrea Lekic, decided to organize her first handball camp was the moment when our road to the top skyrocketed. We became a unique summer sports Academy for young male and female handball players. The Academy got its first students in 2013. We had more than one hundred attendees originating from seven different countries, and they managed to accomplish the scheduled program perfectly, with the help of our team of experts in the beautiful setting of Vrnjačka Banja. More than one hundred children who all wanted quality training as well as having a good time before and after practice became our whole world in the days that followed. During this eruption of children’s energy, attention, smiles, runs, jumps, shots, assists, defenses, conversations and songs, we realized what our mission needs to become. Our children. Who is going to work with them, if not the best of the best? And if not now, when? What do the summer camp participants say? The seven beautiful days that I spent in the camp with everyone are an experience that I will never forget. It will remain in my heart and on my mind for as long as I live. I can only say words of praise for everyone, you all treated us wonderfully. 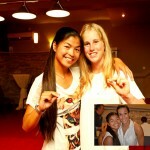 The practice sessions, hangouts, the hotel, the sports hall, everything was the best one could ever imagine. It was a wonderful and unforgettable experience for me. I enjoyed every minute of it. When I applied, I didn’t expect that it would be like this at all. I’ve met some wonderful people, made new friends. I learned a lot from our coaches and I want to thank you for bringing coaches that taught us a lot not only related to handball, but related to life as well. This was an unforgettable experience and I am certain that I will come again. I’ve seen what I am capable of, and I’ve seen whether I can adapt in an environment other than my home handball club. I definitely see myself playing handball in the near and far future, and I will make additional efforts in order to reach my goal. 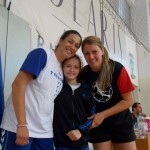 I attended all three Andrea Lekic handball camps. At the very beginning, the warm words of welcome and the welcoming ceremony are enough proof to show how much the Andrea and the rest of the camp organizers care about making us feel at home. When I attended the camp for the first time, I was surprised that Andrea and her guests (Katarina Tomasevic and Jovanka Radicevic) spent the whole time training with us and constantly sharing certain secrets that only elite athletes can know. Every year, the organizers of the camp had an array of surprises, including an animator. I also had the honor of meeting the best left-back in the world, Sanja Damnjanovic. I would recommend this to all of my peers because it is a camp full of hard work, effort, laughter, fun, and when the camp reaches an end and it’s time to say goodbye, a tear or two as well. The camps have been so well organized down to every tiny detail. All the participants were taken care of by Andrea herself and her team 24/7, so I didn’t worried about the safety at any moment, even though I came alone from Norway. We were treated like professional players and trained by the best coaches I have met – they were all committed and highly enthusiastic. Every sessions were unique. All the time exciting exercises and lots of positive feedback to everyone. Other top professional players came also to give their advice, like Jovanka Radicevic, Sanja Damnjanovic and Katarina Tomasevic. We even had separate physical training sessions with professor Marija Lojanica who helped us to become stronger. In the spare time, we got the opportunity to relax by the pool, go for a walk in the city or just play football in the backyard. Every night we gathered with animator Slavica, who made sure that we had fun together and could challenge each other in some other and funny ways. It’s amazing how fast we got acquainted. The first year, I was the only one who didn’t speak Serbian, but that was no problem. All the other participants and everyone in the Lekic Team included me like their family member, thanks to the spirit of the Andrea Lekic camp and thanks to the magnificent effort by Zorica the Camp organizer! I would love to recommend this professional handball camp to everyone. 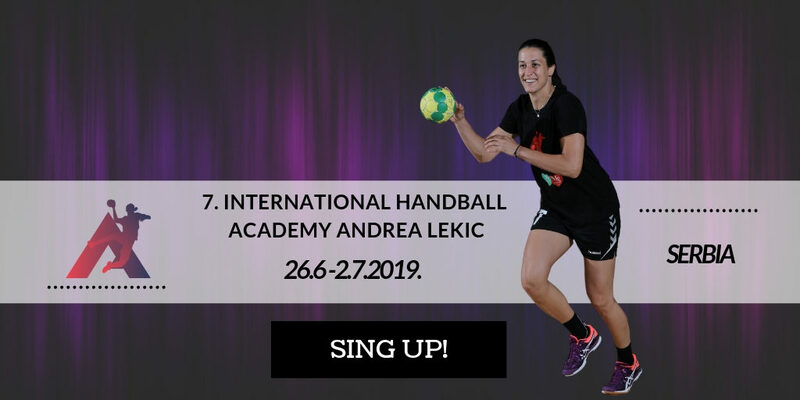 In the handball world we are one team, one family, so I promise you that you are welcome even if you are first-time participant, have another language, are ”lonely”, short or tall – well, nothing should stop you from joining these magic days at Andrea Lekic Camp!